According to the Sun, Amy Winehouse Lioness: Hidden Treasures will help raise money for the charity set up in her name after she died in July. The collection is said to contain original tracks as well as covers, including Amy's recording of jazz standard Body and Soul with Tony Bennett. Producers Salaam Remi and Mark Ronson pulled the album together after listening to thousands of hours of vocals by the star, it was reported. Amy's father Mitch told the newspaper the songs "took my breath away". He said: "Had the family felt this album wasn't up to the standard of Amy's others, Frank and Back To Black, we'd never have agreed to release it. We believe it will stand as a fitting tribute to her musical legacy." Mitch added that he had not heard one of the new songs, called Halftime, before he listened to the collection. Salaam said listening back to Amy's voice was an "emotional" experience, telling the Sun: "I believe she has left something beyond her years. She has put a body of work together that will inspire an unborn generation." 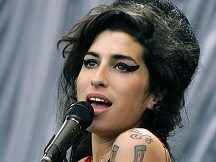 The star was found dead in bed in her Camden flat in north London on the afternoon of Saturday 23 July this year. Last week, an inquest heard the singer was more than five times the legal drink-drive limit when she died aged 27. She was clear of illegal drugs when she died. The new album is reportedly due for release in December, and money from each copy sold will go to the Amy Winehouse Foundation.